Nearly two years ago, I wrote my post #100 which talked about customized FSDiscover data for Orbx’s NA region. So in this post #200, I will also talk about my newly compiled FSDiscover data for Orbx’s UK areas. Following the same principle, I categorized Orbx’s original Points of Interest (POIs) for England, Wales and Scotland into two FSDiscover data files so that they could be easily assigned with different colors for easy identification. Moreover, many of the locations (especially lighthouses) have been eye-ball checked and updated to ensure accuracy. And for this special occasion, I will open the download link for seven days until Jul-10. After it, the link will be obsolete and only be available to FSX Times Subscribers requesting for it. Since somebody asks, here are the links for AU and NA POIs as well. Updates for NA should be coming soon. FSDiscover by Flight1 is a navigation tool addon for FSX, which is very useful in locating airports and sightseeing spots for flightsimmers. 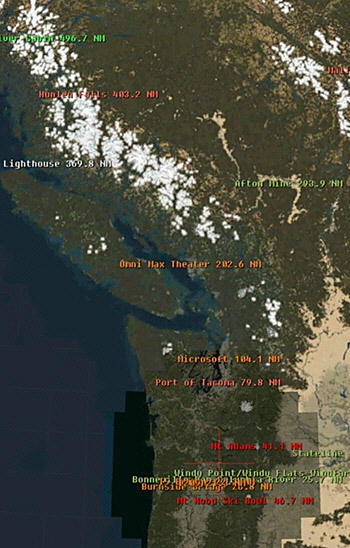 Orbx’s NA BLUE Pacific North West (PNW) comes with an FSDiscover data file for the region’s Points of Interest (don’t remember if it was created by Orbx officially or by some members from its forum). However, the file contains airports information in the region as well, which causes unnecessary duplications when FSDiscover is showing airport names.